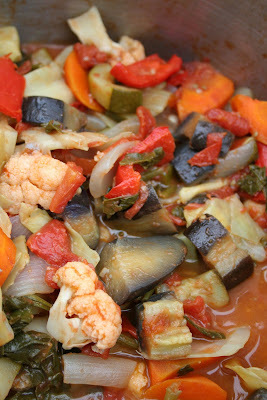 All summer long, (well, I didn't feel like we had a real summer this year though...) I bought Japanese eggplant, zucchini, tomatoes..., at the farmers market and I've been making pot-full of ratatouille almost every week. In my version, I use KONBU (Kelp) under beneath of those vegetables. I think it doesn't bother vegetable's flavor, and UMAMI flavor is soaked up into the vegetables. 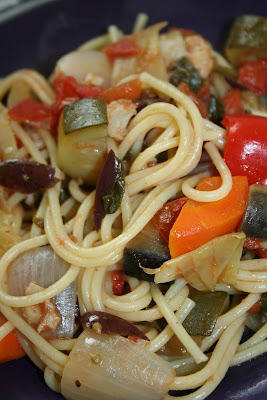 The next day, I toss with spaghetti and it makes a quick lunch. 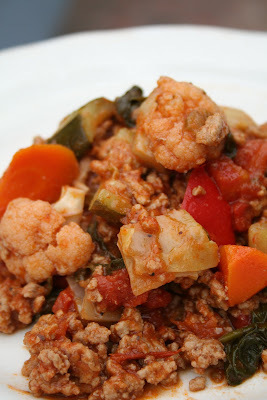 Dinner for my husband, I mix with turkey meat sauce and volumed up.